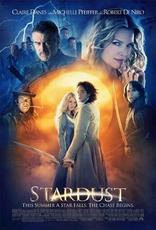 Stardust Synopsis :The sleepy English village of Wall is named for the cobblestone wall that has, for eons, kept the villagers safely apart from the supernatural parallel universe that lies just on the other side. It is here that young Tristan Thorne (Charlie Cox) makes a wild-eyed promise to the prettiest girl in the village (Sienna Miller), whose heart he hopes to win: that he will bring her back a fallen star. Now, in order to make good on his promise, Tristan will have to cross the forbidden wall, and enter a mysterious kingdom lit by unending magic and unfolding legends of which he will quickly become a part. In this fantastical realm known as Stormhold, Tristan discovers that the fallen star is not at all what he expected but a spirited young woman (Claire Danes) injured by her cosmic tumble. Now, she is in terrible danger -- sought after by colossal powers including the "King's" (Peter O'Toole) scheming sons for whom only she can secure the throne; and a chillingly powerful witch (Michelle Pfeiffer) desperate to use the star to achieve eternal youth and beauty. As Tristan sets out to protect the star and bring her back to his beloved on the other side of the wall, his journey will bring incredible encounters with a pirate captain (Robert De Niro) and a shady trader (Ricky Gervais), among other surprises. But if he can survive by his wits and the strength of his newfound love, Tristan will also uncover the secret key to his own identity and a fate beyond his wildest dreams. Cast: Claire Danes, Charlie Cox, Sienna Miller, Ricky Gervais, Jason Flemyng, Peter O'Toole, Michelle Pfeiffer, Robert De Niro. Release date: Friday August 10, 2007.